You're a dress designer with this Teddy Dough Doll Kit. Create beautiful custom doll dresses that can be refashioned as many times as you like from our popular Teddy dough. Part of our "Build, Play, Break" series this kit is meant to be re-used. And if you run out of dough - just top yourself up with our Teddy buckets of assorted colours. 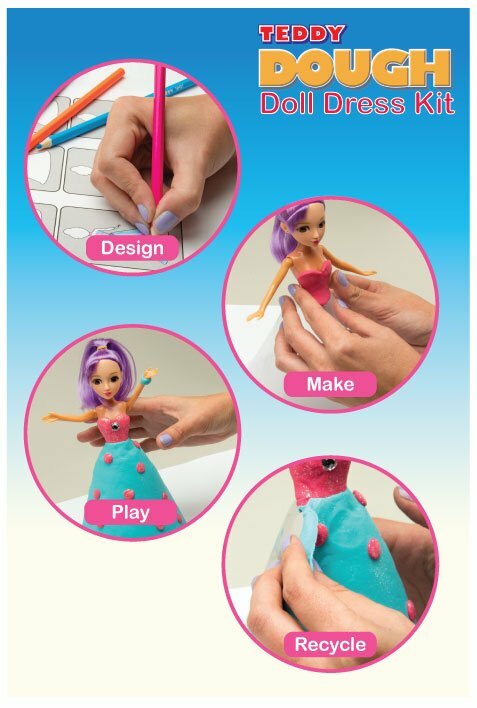 Build, Play, Break as per our other creative dough kits with this cool dough doll dress design kit. Full instructions on the pack! First sketch out some ideas before you create your dress. Use our handy suggestions on the pack for interesting colour combinations, jewellery ideas and more. Create your dress, by rolling the dough with a rolling pin (on a protected plastic surface) and cutting the pattern as illustrated on the box. When you are done, your doll is ready for the ball or the catwalk! When you are done playing, break your dress up and store the dough in an air-tight container to keep the dough fresh for your next design session. If you run out of dough, just top up with any of the Teddy dough variants on offer. This item has 2550 views.